Open Gym and Intramurals are a great way to get regular exercise and to play on a team sport. Intramurals are an opportunity for students, faculty and staff to recreate and to get together outside the classroom for good competition. To play in intramurals you must be a UAS student or 18 years or over. The year will start off in the fall with open gym time. For each intramural there is a specified time that the court is reserved for your use. Following in the spring, Basketball (currently) shifts into a team structure with dates for games and ending with a final competition. The winning team photo is displayed in the gym for that year. Please view the REC calendar for court times or the tabs above for each sport. 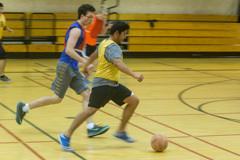 Basketball this spring semester will be on Monday, Tuesday and Thursday evenings to accommodate this year's Intramural program. Tuesday is multi-sport open gym with Monday and Thursday evenings reserved for basketball intramural games. During these evenings the REC provides the court, balls, team colors/tank tops, and refreshments at our service desk. In the spring when teams are created the rules of the game will be developed prior to the first game. Last year we heard from basketball intramurals that players wanted referees instead of self regulating, players could not jump teams, and to maintain a minimum age of players at 18 years of age or older. Referees from each team will be identified soon into the season. The REC Center has created a part-time position of Intramural Coordinator with main duties being basketball program coordination that begins this spring. Please download the team sign-up form (registration closed) and complete. Completed forms should be emailed to uas.rec@alaska.edu or dropped at the REC service desk. Team registration forms will also be handed out at upcoming Fall open gyms and at the Fall 3-on-3 tournament. Team forms are due back by January 24, 2019 at 10pm. Pictured above are last year's basketball champs, the Has-Beens. View more basketball photos from our Flickr album. This season's tournament format will begin when teams have been confirmed and start with a Round Robin. Games will likely end up just before spring break. Following spring break we will use the results of the round robin to feed a double elimination. 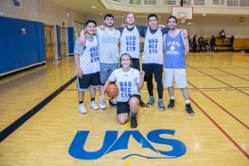 For more information specific to UAS Basketball Intramurals please view our Facebook group page. Soccer this spring semester is on Wednesday nights (7:00pm-9:45pm). During these evenings the REC provides the court, nets, balls, team colors/tank tops, and refreshments at our service desk. Wednesday nights from 7:00pm to 9:45pm. Friday nights from 7:00pm to 9:45pm.